Vans come in all shapes and sizes, and it is very important that you purchase a van suitable for your requirements. The Luton van is the largest van before the small lorry category, and is ideal for house removals and larger deliveries. These vans tend to have tie rails in the back, to which you can fasten ropes in order that the furniture or goods you’re transporting don’t slide around. 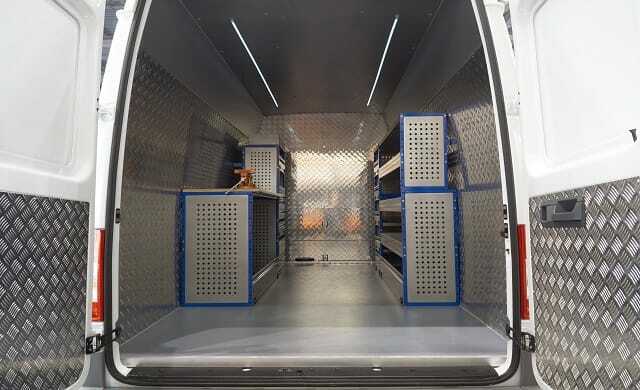 Some of these vehicles are designed to store tall metal shelving, so they have a different style of racking. Transit vans are slightly different. They don’t have tie rails because the shape of the van is not conducive for these. Instead, most transit vans are protected in the back by plywood, which protect the outer shell from dents and scratches, and its smooth surface is easier to keep clean. When kitting out your van, there are two options. Vans can either be ordered with the correct internal bodywork to suit your requirements, or they can be purchased without any particular interior, which allows businesses to custom-build the internal structure to suit their needs. It is also easy to alter the inside if the use of the van changes. Charlie Mullins from Pimlico Plumbers, says he designed his own bespoke racking which was installed after he bought the vans. A transit van can be fitted with plywood panelling before or after purchase and it’s not very expensive to do, ensures Angus Elphinstone. It will cost around £200 for a medium-sized van.